15m long - Next generation active optical HDMI cables designed for next generation 4K UHD with HDR content, the WyreStorm CAB-HAOC-15 delivers uncompressed full bandwidth 18Gbps HDMI content up to 15m/49ft using the latest optical transmission technology. The highest possible bandwidth that currently exists according to the HDMI 2.0 specification can be sent, uncompressed with WyreStorm’s hybrid AOC cables using the latest optical transmission technology. 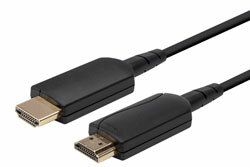 Free the audio from your SmartTV with this cable. Although your TV does a great job of displaying VoD content from various outlets, when it comes to audio, it needs some help. The CAB-HAOC cables mean 5.1 Dolby or DTS audio can be sent from the screen to an AVR located up to 30m/98ft away. Being essentially a long HDMI cable, source devices see this cable as such meaning that complicated electronics to handle encryption “handshaking” are not required meaning a cheaper extension solution. The only electronic signals are kept within the 1” HDMI head, meaning that electronically “noisy” environments such as industrial or retail premises previously were unsuitable for copper transmission. Using optical transmission over 4 fibre cores, the CAB-HAOC’s provide a much stronger, more reliable signal. Next generation active optical HDMI cable designed for next generation 4K UHD with HDR content, the WyreStorm CAB-HAOC-20 delivers uncompressed full bandwidth 18Gbps HDMI content up to 20m/65ft using the latest optical transmission technology.